It’s inherent for artists to create a craft or showcase their talents to express themselves. Inspiration is the fuel that makes a creative’s mind turn, but the bigger picture sits on what follows the creation process – the recognition and nurturing of artists’ gifts. Budding artists, most of them young, are testing their capabilities and are looking to professionals for advice on how to make it big in the creative scene. Creative gatherings, events, and workshops are bridges that connect novices and experts. They also serve as platforms where inspiration and potential business partnerships bloom. An important facet of the country’s identity, the Philippines’ creative industry has been elevating artists to local and international recognition for so many years now while also contributing to the nation’s economic growth. Aiming to harness this pool of creative geniuses, the government through the Department of Trade of Industry is building a stronger and more competent Philippine creative industry. Born out of this endeavor is CREATE Philippines, a trade event on Oct. 20 to 22 organized by the DTI through the Center for International Trade Expositions and Missions (CITEM) that will promote the lucrative economic potential of the country’s creative industries to an international market. It will encourage sharing of innovative business ideas and collaborative opportunities. CREATE Philippines coincides with the 66th edition of Manila FAME, the country’s premier and lifestyle platform also organized by CITEM. The event has three major components: forum, exhibit, and music fest. With the theme “Developing an International Market for Filipino Creative Content and Creative Services,” CREATE Philippines’ series of forums feature some of the biggest personalities and industry leaders from the country’s fast-growing creative sectors: Visual Arts & Graphic Design, Music & Performing Arts, Film & Animation, Digital Games & Apps, Advertising Content & Production, and Communication Design. Representatives from popular brands and companies such as Google, Billboard, Walt Disney, ABS-CBN, and Team Manila, among others, are sharing their success stories and vision on how to develop the country’s creative industry. Creative councils are also participating, namely: Game Developers Association of the Philippines (GDAP), Animation Council of the Philippines (ACPI), Communication Design Association of the Philippines, Soundsright, the British Council, Association of Accredited Advertising Agencies Philippines, CPHG, and the Philippine Association of Independent Music (PHAIM) established by Homonym. The Design Center of the Philippines (DCP), Cultural Center of the Philippines (CCP), Board of Investments (BOI), National Commission for Culture and the Arts or NCCA) are the government agencies supporting CREATE Philippines. 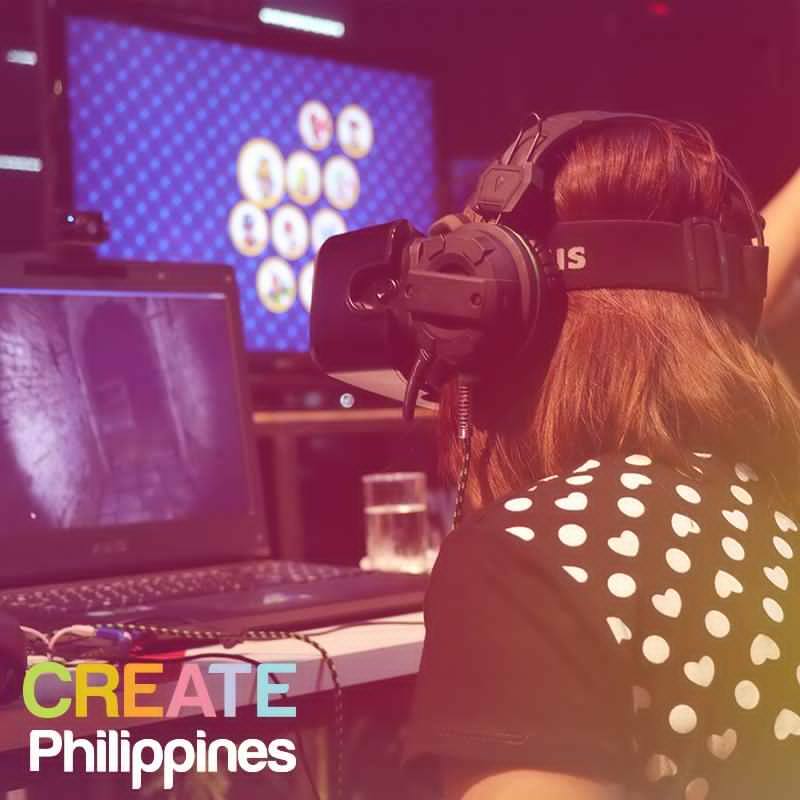 CREATE Philippines serves as the launchpad for the Creative Economy Council of the Philippines (CECP) as the new generation of industry champions. CECP aims to elevate the country as one of the top five creative economies in Asia Pacific by 2030 alongside South Korea, China, Japan, and India. The exhibit dubbed as ArtAlive is a showcase of the Filipino creative heritage: the pre-conquest artistic expressions and crafting traditions, contemporary products, and the modern global influences in design, music, animation, film, and visual communication. ArtAlive has two touchpoints: Creation Station and Uni-Installations by design schools and universities. Featuring pocket performances of independent bands, the music fest shines a spotlight on Ben & Ben, Conscious & the Goodness, and Ang Bandang Shirley, among others. The National Digital Arts Award (NDAA) Night will be held on the last day of CREATE Philippines on Sunday, Oct. 22. Launched by Globaltronics alongside Brand Guerrilla PH and Synergy88, NDAA is a competition for young Filipino digital artists that aims to recognize and encourage the youth’s creative skills and talents in digital games, animation and motion graphics, and print. Sponsored by PLDT Enterprise and Team Manila, CREATE Philippines an official trade activity of the ASEAN Summit 2017 under the ASEAN 2017 Committee on Business and Investment Promotions (CBIP) led by Department of Trade and Industry (DTI) Undersecretary Nora K. Terrado. Ex-Link serves as the event management and marketing partner, with Brand Guerrilla, Globaltronics, Synergy88, and 1-Digi Relate as event partners. For more information, visit www.createphilippines.com.